We gratefully acknowledge Savage and Polite's Antique Clocks Identification and Price Guide for providing these photos and descriptions. To see what these clocks have actually sold for at auction, please visit their site. They have prices and descriptions for more than 12,000 antique clocks of all different types and makers. 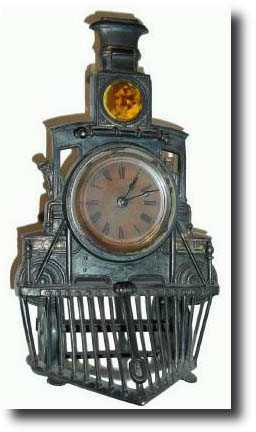 C.1886, Ansonia Novelty clock No. 44, Locomotive in good original condition. These are white metal castings with fine detail and are relatively fragile. Many that we see have fallen off the shelf and the cow catcher broken and so on; this one is still intact (wear to gilding and silvering commensurate with age). Although the dial is dark and there are minor nicks and scrapes, this is still a good example and with rear wind movement running. See also lot 550. Height 7"